I will let you into a secret. 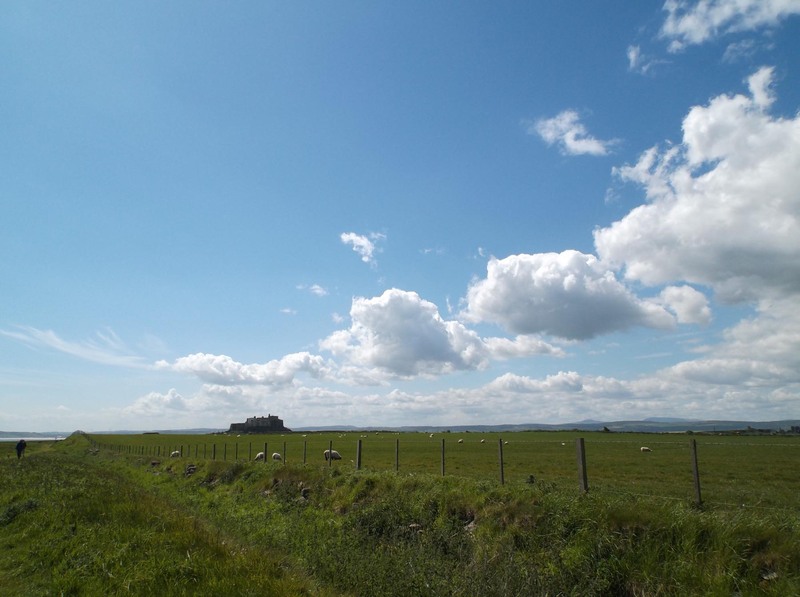 It was for this view that we moved the 400 miles from Devon to live in Northumberland. 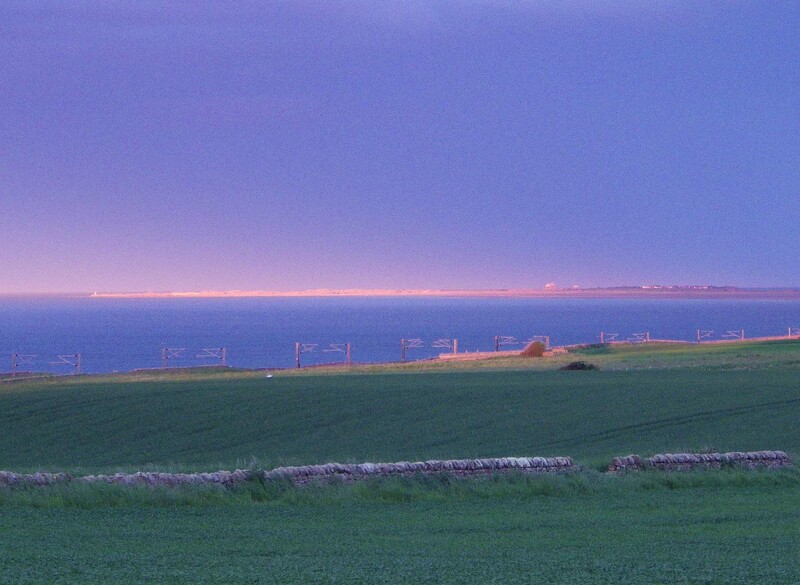 You are looking out of the window, over the fields, over the Eastcoast railway line, over the sea, towards Holy Island. That bump that you see towards the right of the picture is the Elizabethan castle standing proud on Beblowe crag. In differing lights the island looms grey or shimmers as a mirage. Sometimes it is wrapped in mist. It is always fascinating. It is as though one is glimpsing Avalon, the Isles of the Blest, a place associated with deep yearning and longing – and peace. Although I have always felt drawn to this distant vision, I haven’t always enjoyed going to Holy Island. Our first visit was in August 2004. Like the rest of the day-trippers, we’d checked the tide tables and driven over the causeway in a busy queue of holiday makers. 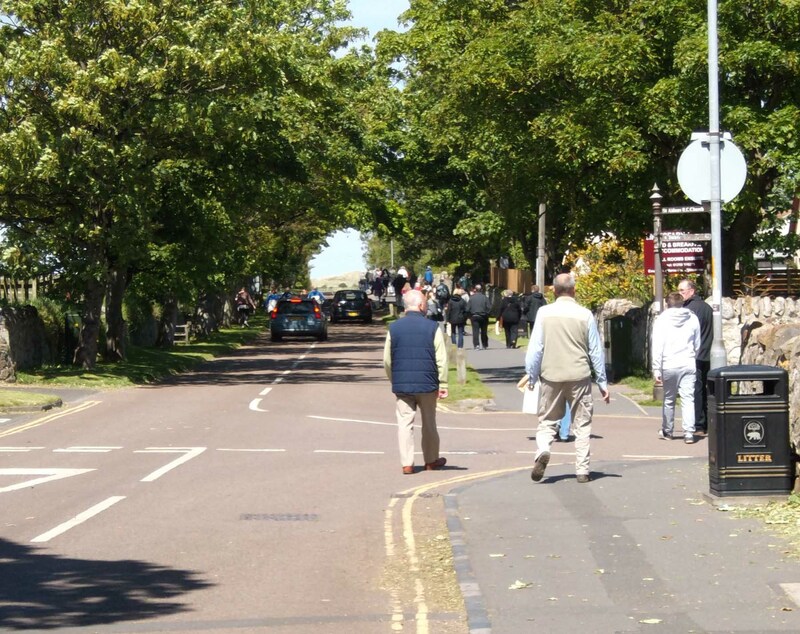 We were directed into a huge busy carpark, and followed the stream of people walking into the village where it’s all busy and bustling, and you can join the rest of the crowds in the tiny Lutyens castle, the mediaeval priory or the usual mish-mash of touristy shops. Nothing special there. Just busy, bustling and bustling. 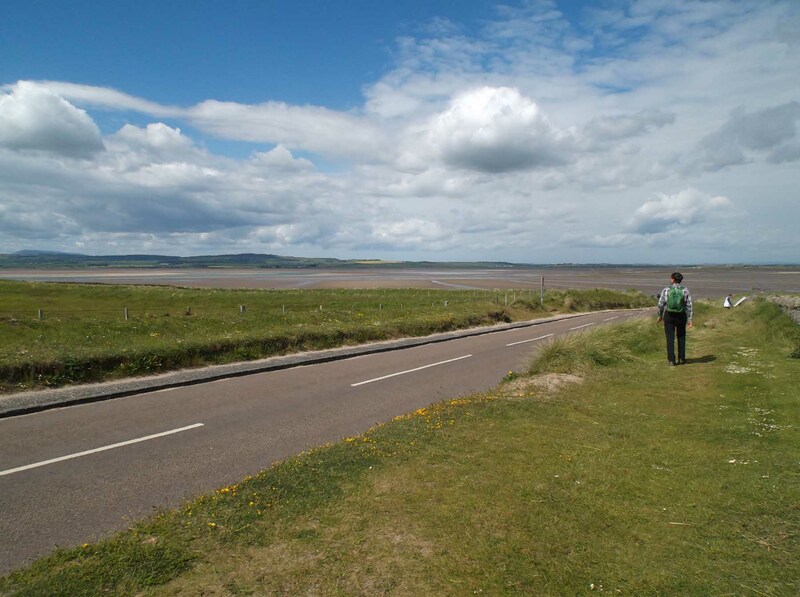 How to reconcile this with the spiritual intensity of St Aidan and St Cuthbert, to draw near to the harshness of life that those amazing monks experienced who produced the Lindisfarne Gospels, to understand the holiness of the place? Well – we have learned the way. Now I can feel the island calling to me when we have not visited for a while. It has worked its magic on me, and I am a disciple. So – let me tell you about our visit earlier this week. 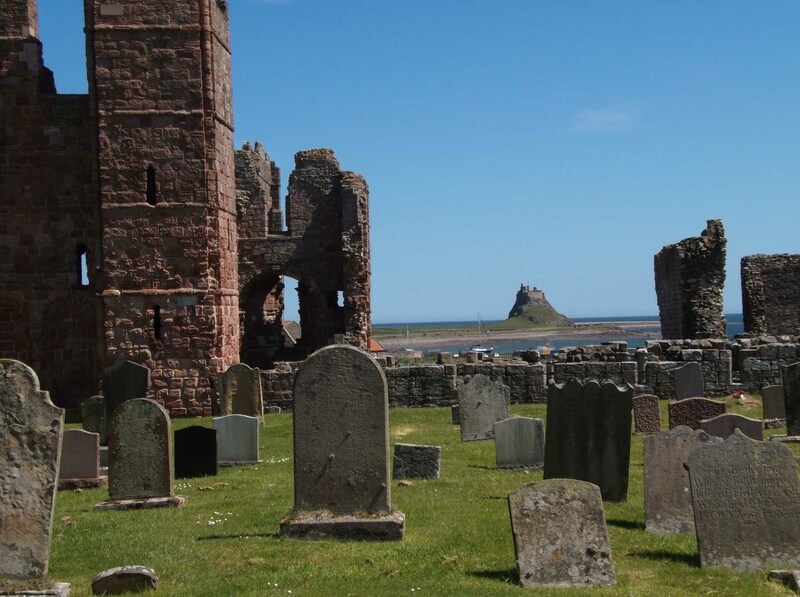 The Holy Island of Lindisfarne is not really an island. It would be much more accurate to call it a peninsula. Peninsula – from paene meaning nearly in Latin and insula meaning island. It is just that: nearly an island. 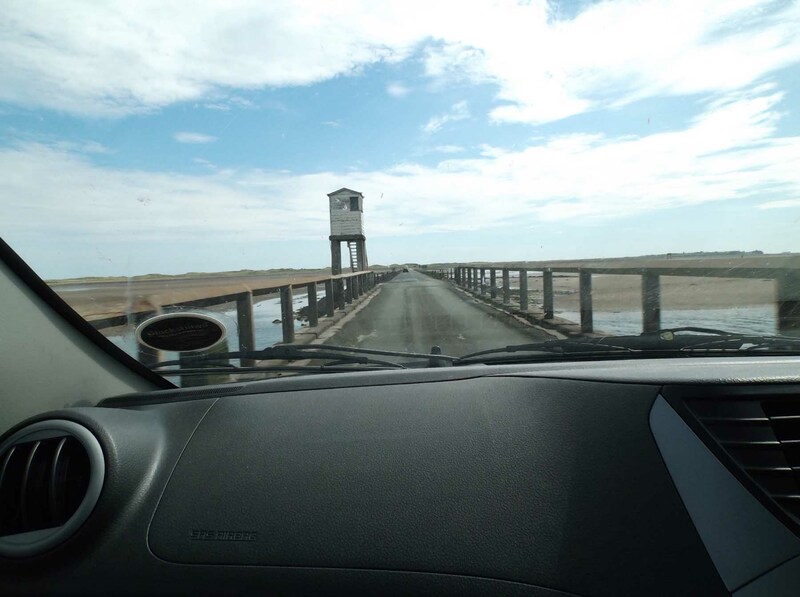 You have to cross a causeway to get to Holy Island, and the causeway is flooded by the tide twice a day. So for approximately eleven hours of each day it’s inaccessible by road. 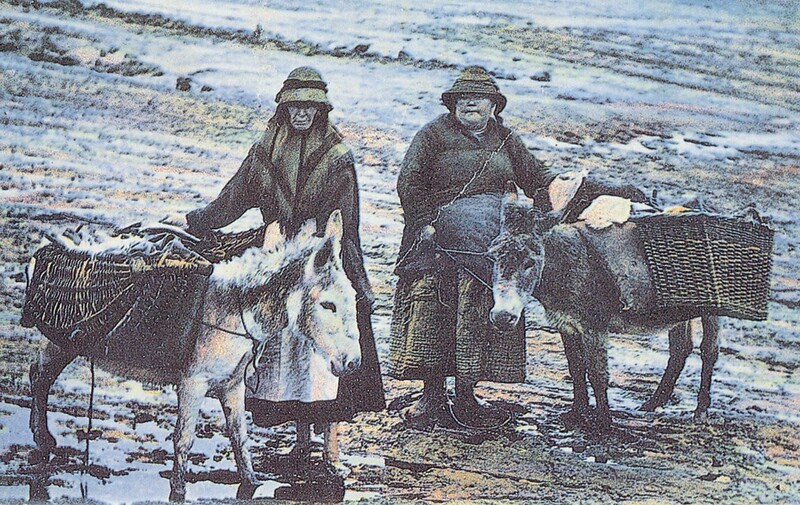 Before the causeway was built in the sixties, you had to approach by boat, or else walk with your donkeys over the sands as these two good ladies did. Were you to cross when the tide was high, you would be unable to drive right over the causeway. You would have to take refuge in this rickety little wooden hut and wait for the tide to go down. You are still directed into the huge busy carpark. 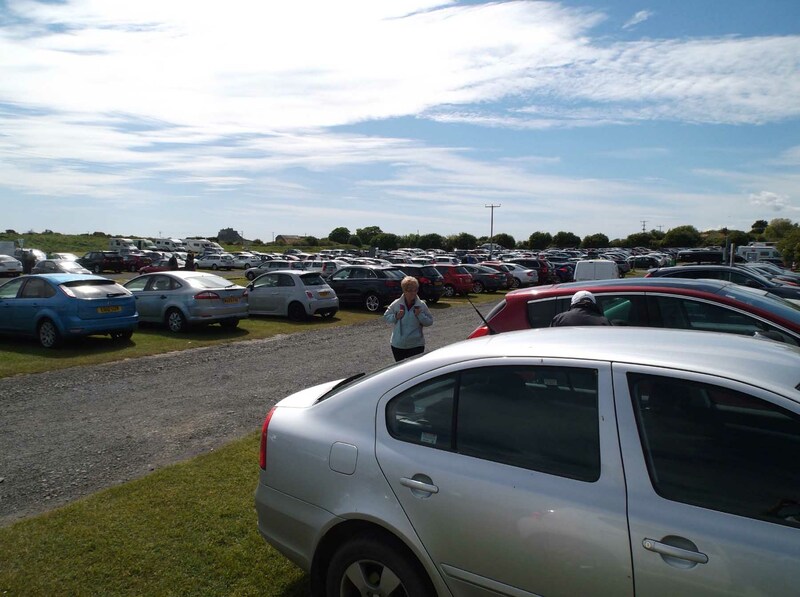 Even though it’s a long way off the school summer holidays, the carpark is crowded and busy. 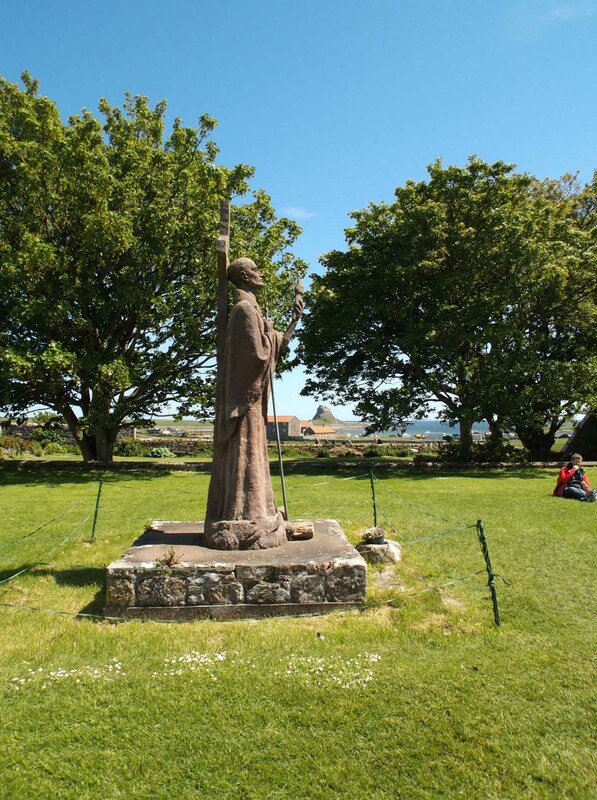 Holy Island is an immensely popular visitor attraction. But it is from here that we diverge from the masses. 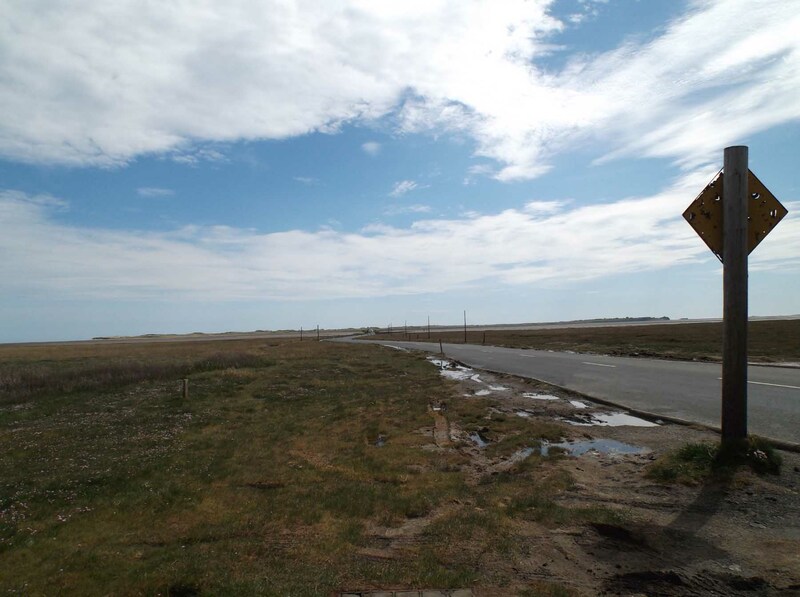 While most people walk into the village (or catch the local hopper bus), we back-tracked and walked along the road to a footpath that takes you over to the dunes. The expedition has begun!! You can immediately see how different this area is. 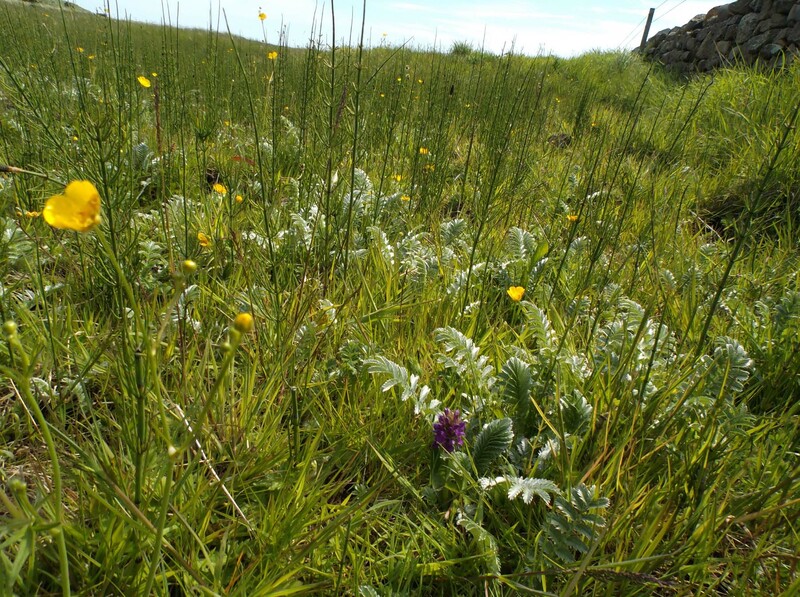 The wild flowers are fantastic. 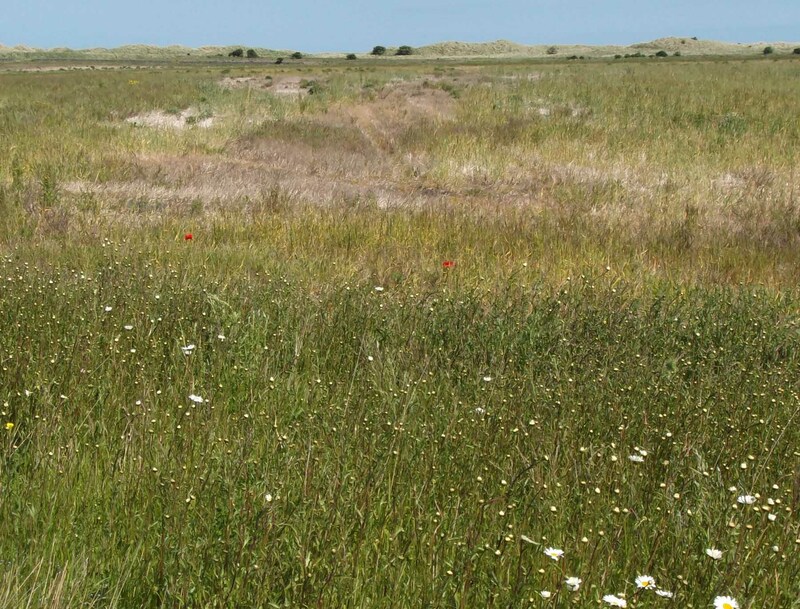 There are poppies and daisies…. 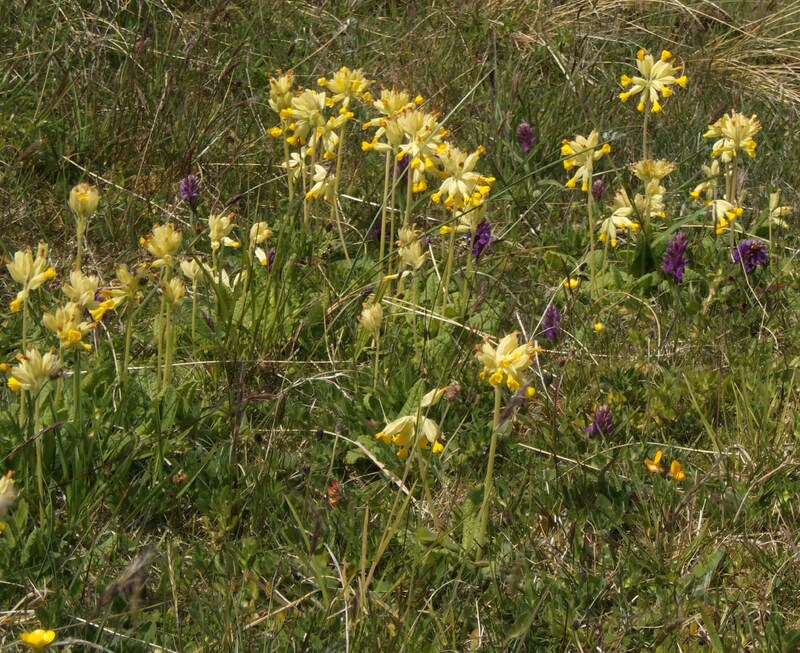 and cowslips and orchids and buttercups and vetch….. There is also piri-piri. At this time of year it is young and green and harmless. 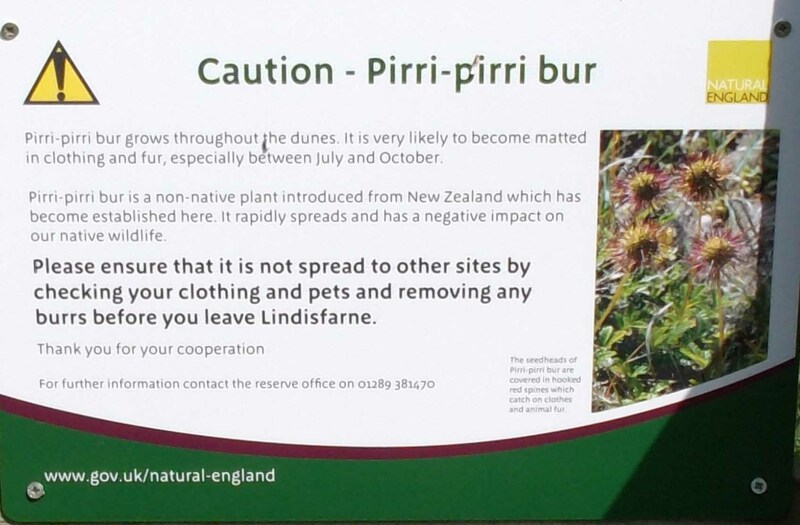 There are warnings about piri-piri, and rightly so as it is most tiresome and we definitely do not want it to spread. One year, later in the summer, I unwisely trampled in the piri-piri and this was the result. 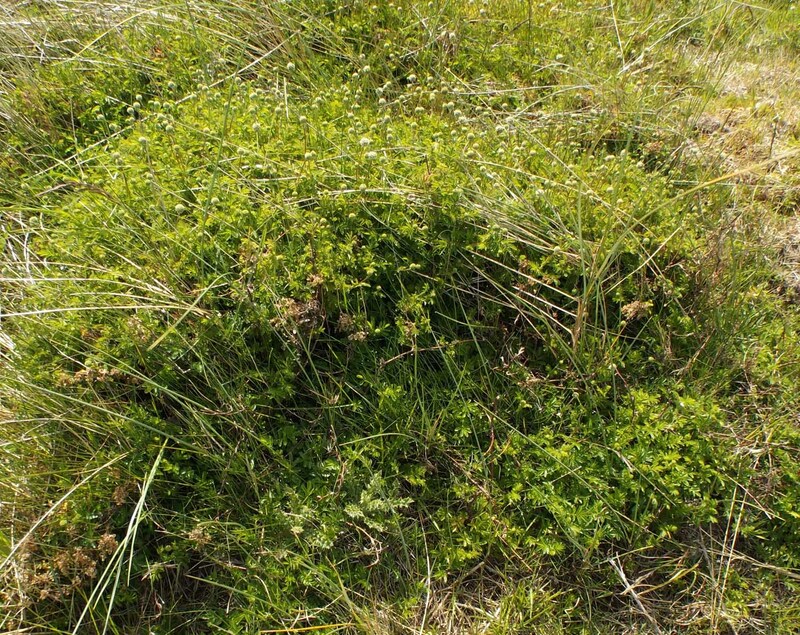 This plant has the best survival tactics of any I have ever known – it attaches itself with little wiry hooks which are the very devil to remove. and then it travels with you until it finds a nice new uncolonised spot to invade. 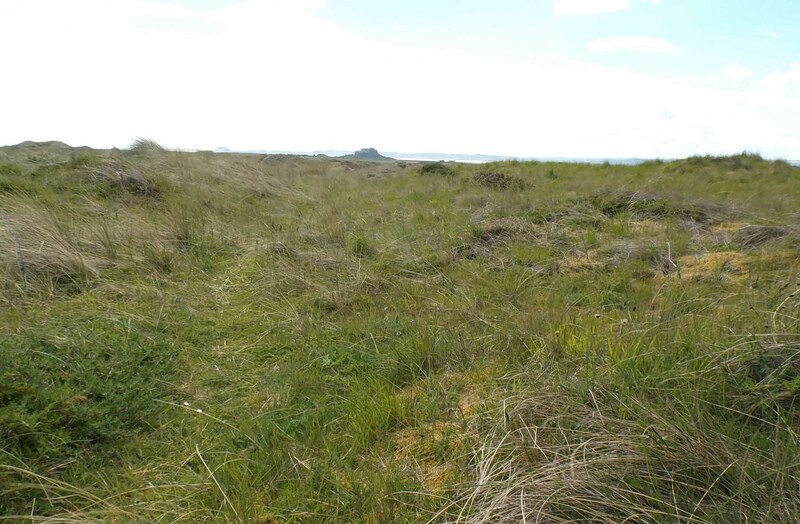 After you leave the meadows, you climb up into the dunes, and there is the sea! 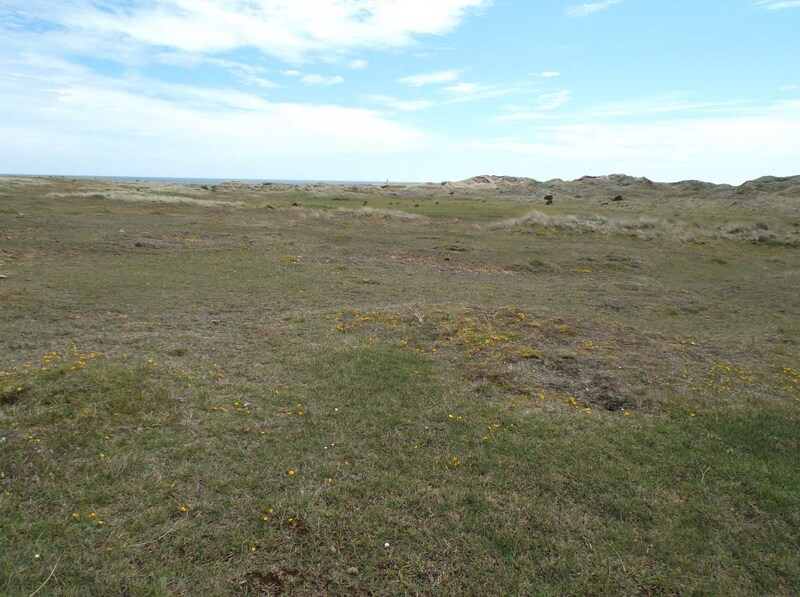 The vegetation is different here – more sparse and lower growing. Everywhere the birds are calling. I cannot capture the many larks we see as they fly up and up and up with their glorious singing. But believe me, they are there, and their song is beautiful. We sat on the edge of the dunes and looked down on this wonderful white empty beach. Not a lot of birdlife here today, and no people at all. Strange – there are usually oyster catchers, curlews and redshanks, and at least the odd beach-comber competing for finds. 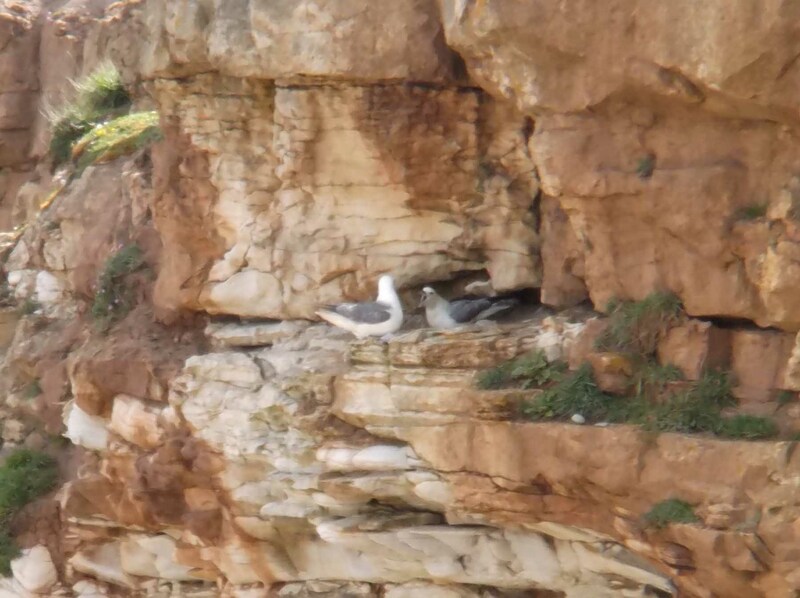 There are, however, quite a few kittiwakes chicks in nests on the cliffs. We can see one nest quite clearly. There is a very demanding chick there! You can see its open greedy beak, and boy, could we hear it! When parents arrive with food, the chicks go wild and make an unholy din. After watching the birds, we turn inland again and head for the castle. It is fascinating how many different sorts of terrain there are on one small island. We call this part the Moon Landscape. It is actually what was once Nessend Quarry. 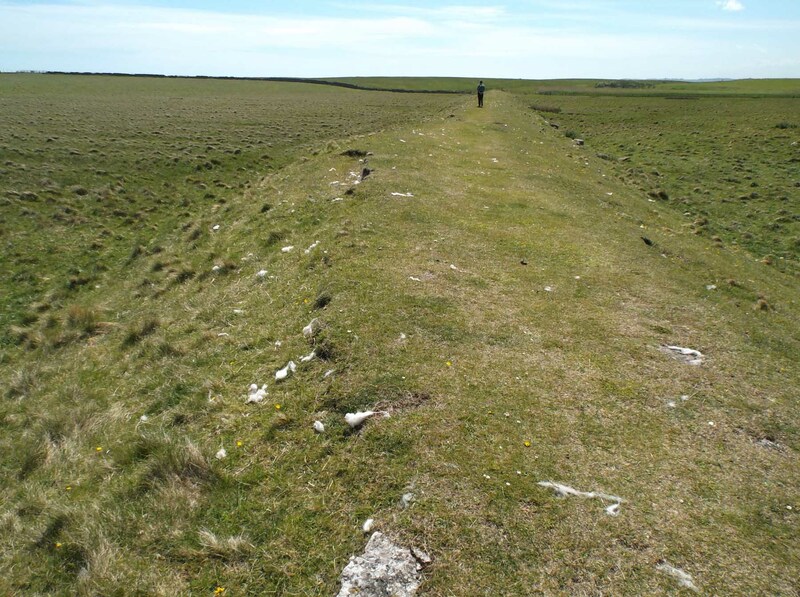 This is where, in the 1860s, they quarried for limestone. 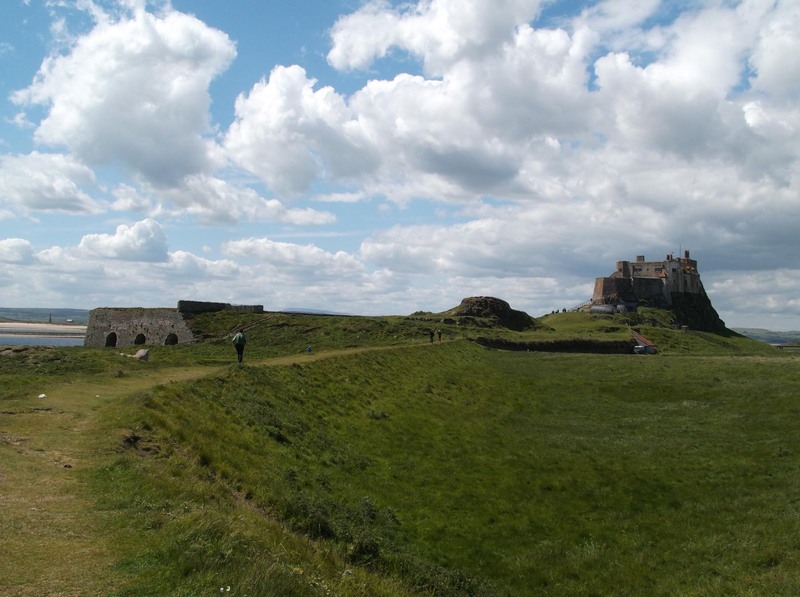 The extracted limestone was fed into the limekilns (at the foot of Lindisfarne Castle) where it was roasted into quicklime (commonly used as an agricultural spread for neutralising acid soils). You clamber out through sandy dunes and are back in meadowland again. We are once more in the land of verdant greenness. 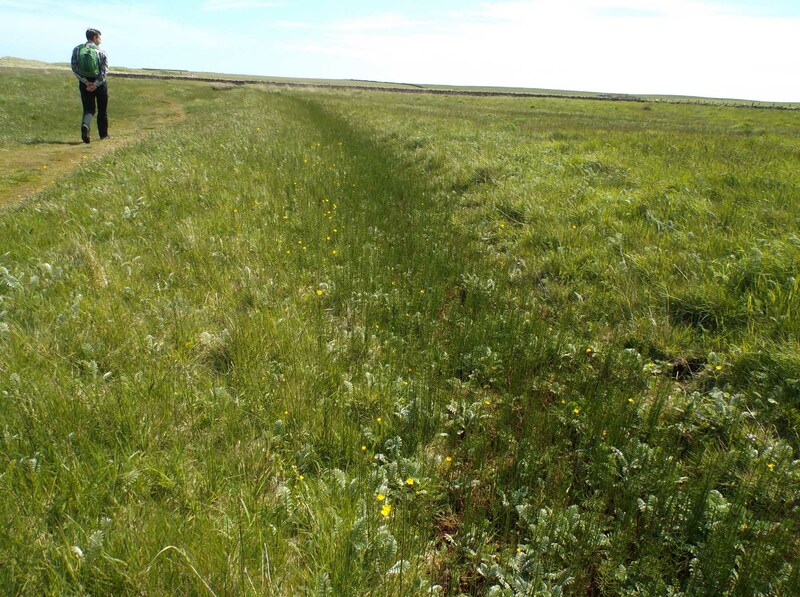 There are traces of old dykes and ditches. The monks farmed here so these may be very old indeed. We turn onto the old tramway that once carried the limestone to the Castle lime kilns. 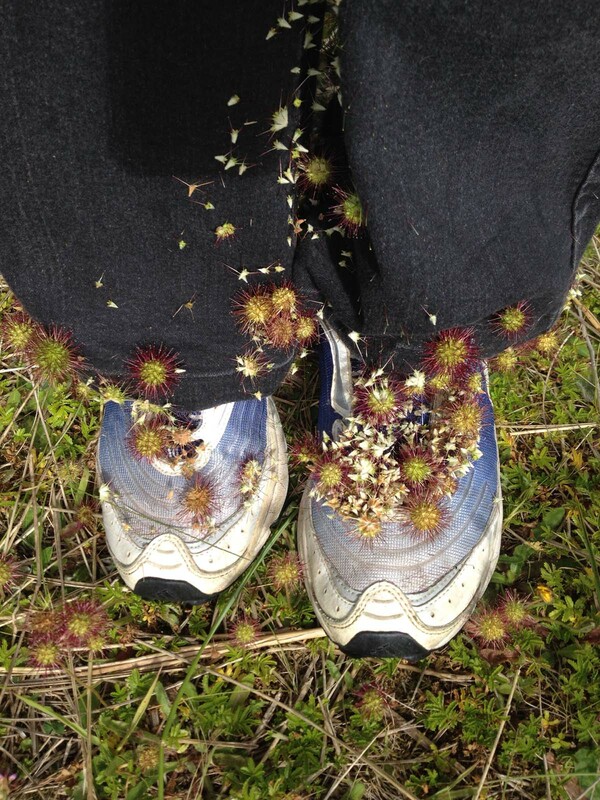 This is very comfortable walking after the rough terrain of the quarries and dunes. They’ve clearly been shearing the sheep – bits of their fleece are scattered all over like snow. 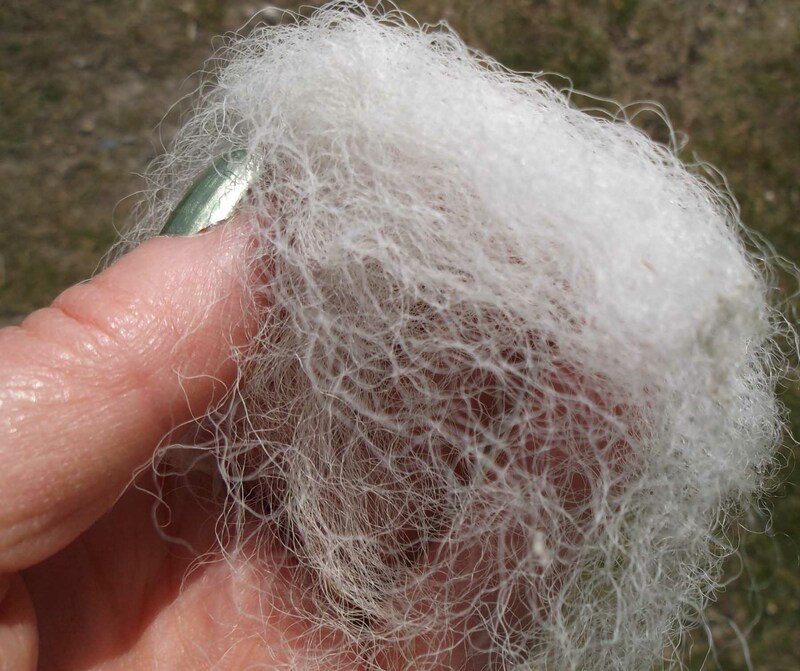 But it’s a coarse fleece – I shan’t be taking any home to spin. Now we’re beginning to draw closer to the castle, and we can see the sheep whose fleece I’ve been inspecting. 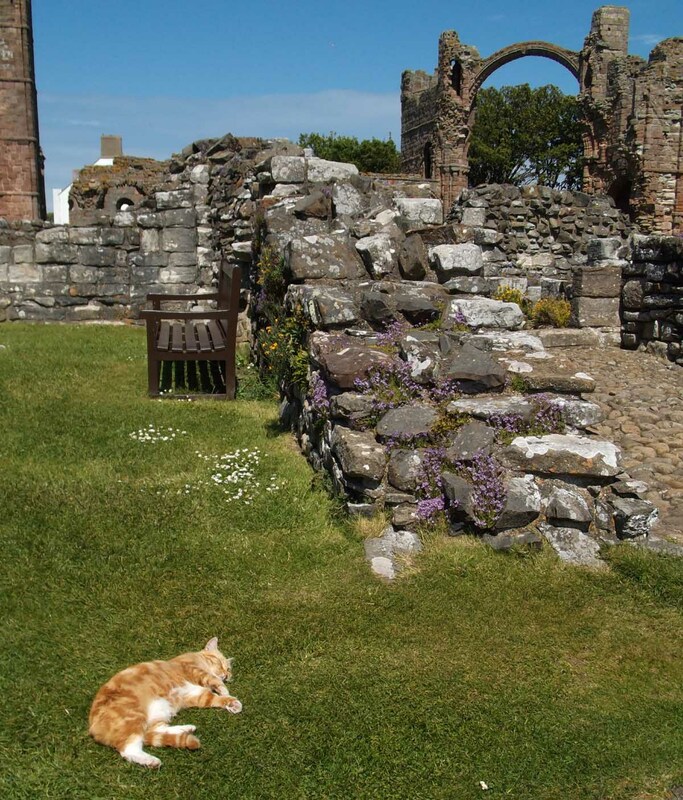 I love Lindisfarne castle. The washed colours remind me of an Uccello painting. It is not an old castle as British castles go – nor did it see important action. A castle was first built on the protruding rock of Beblowe Crag in the 1570s as part of the English defences on its unruly Scottish borders. But in 1603 the crowns of England and Scotland were united under James (1st of England, 6th of Scotland), so after that the castle was rather unnecessary (although a small military garrison was maintained there for another three centuries). It was reborn into modern life in the early 20th century when Edward Hudson (the owner and founder of Country Life magazine) acquired the building. He appointed the distinguished architect, Edwin Lutyens, to convert the castle into a home. Lutyens made a magnificent job of it. It is enchanting inside – simple magnificence combined with a strong eye for detail. 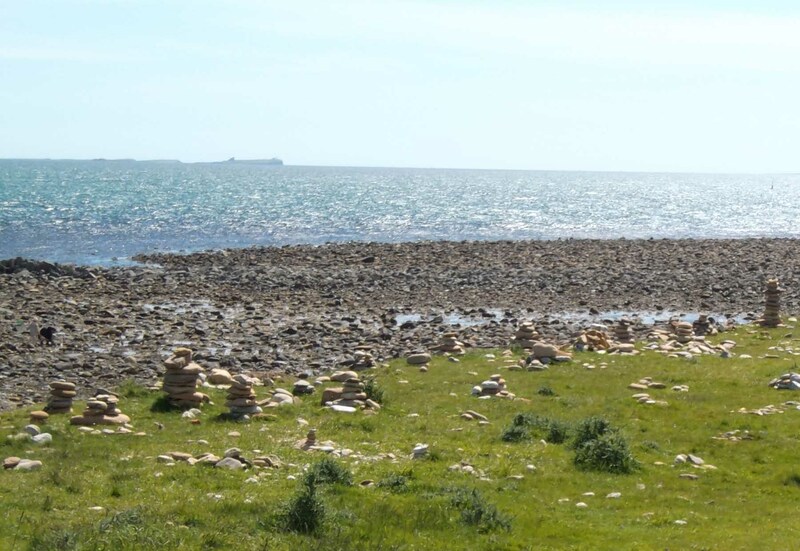 On the shoreline below the castle people make cairns with the local stones. 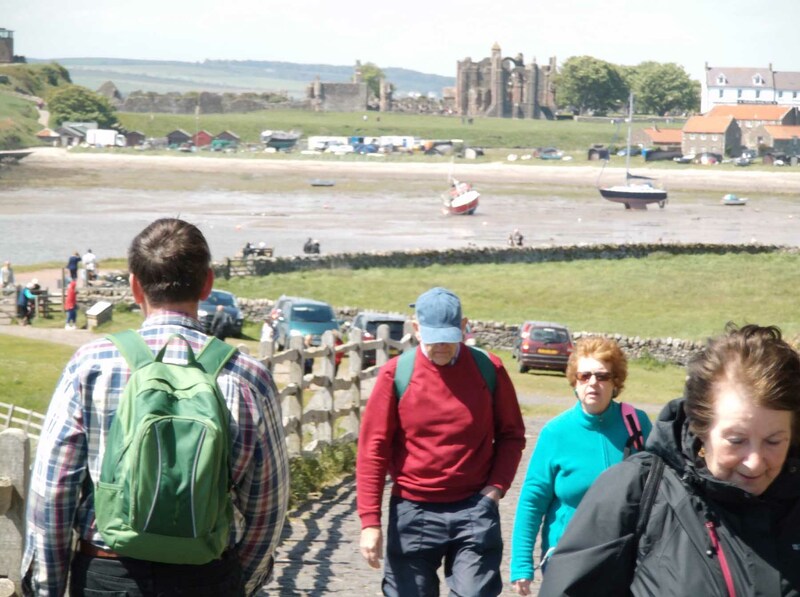 We may not all visit Holy Island as Christians, but without doubt many people find in the place a deep spirituality. I think this couple were building a cairn to commemorate the scattering of cremated ashes. 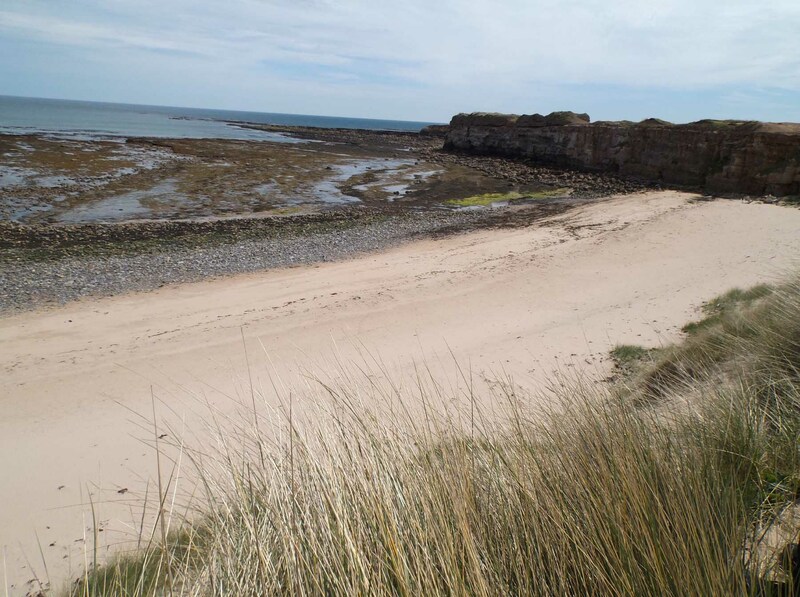 I can well understand why you would wish to leave the ashes of those precious to you in the care of these little islands on the Northumbrian coast. 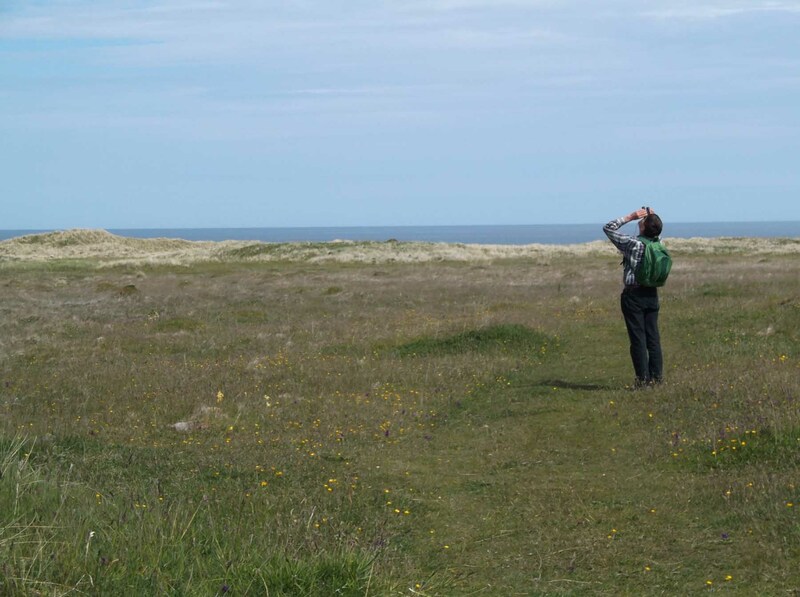 On the distant horizon is the Inner Farne Island, whither Cuthbert retreated when he could no longer cope with the busyness of Lindisfarne. 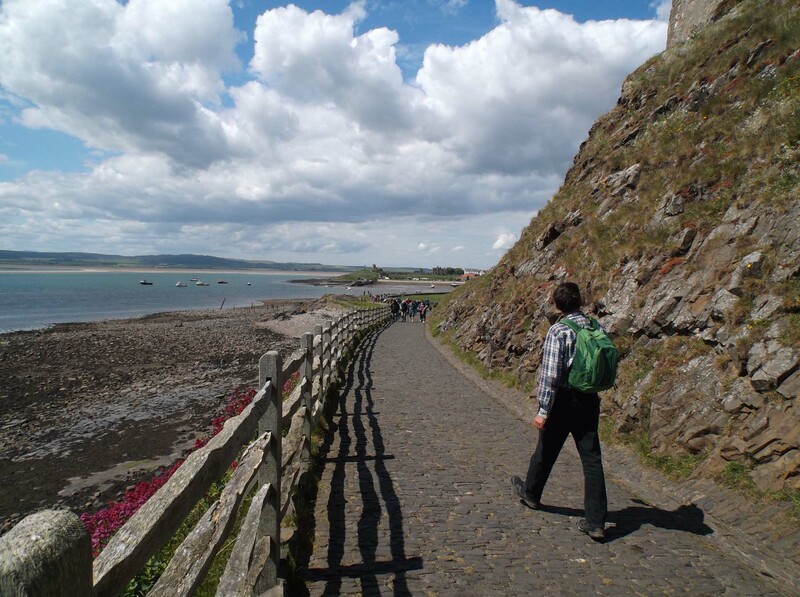 Now we are rounding the shoreline and the old tram road path leads up to the Castle (those arches on the left are the Lime Kilns). 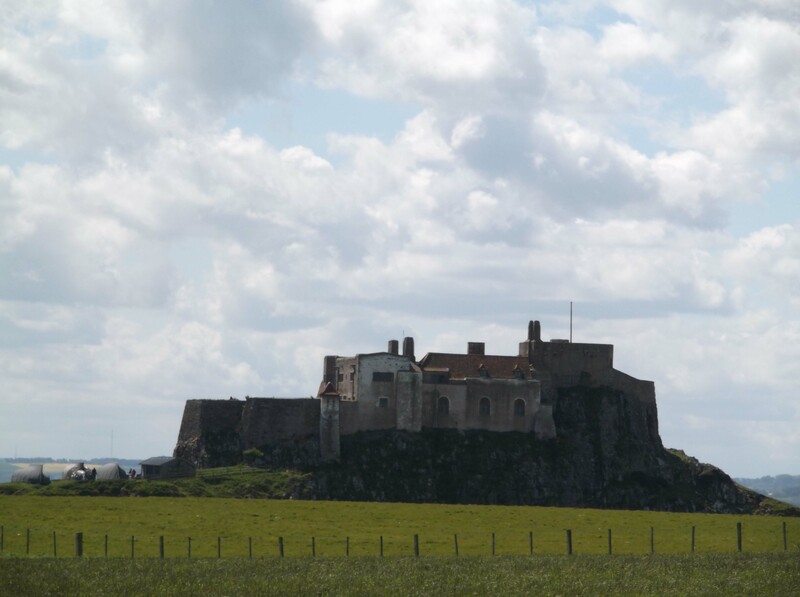 The castle sits like a galleon sailing in these magnificent Northumbrian skies. 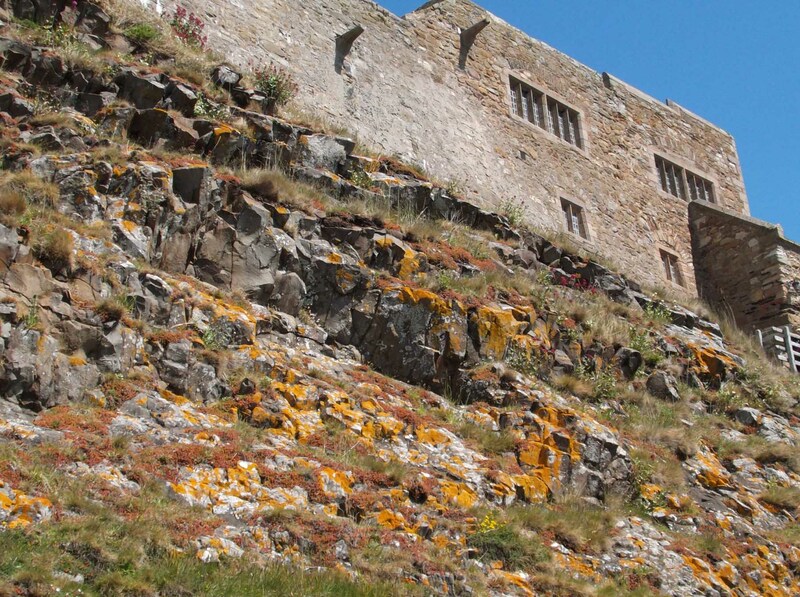 We are nearing civilisation … But first, glance up at the golden lichen on the castle approaches. Lichen thrives where the atmosphere is pure. 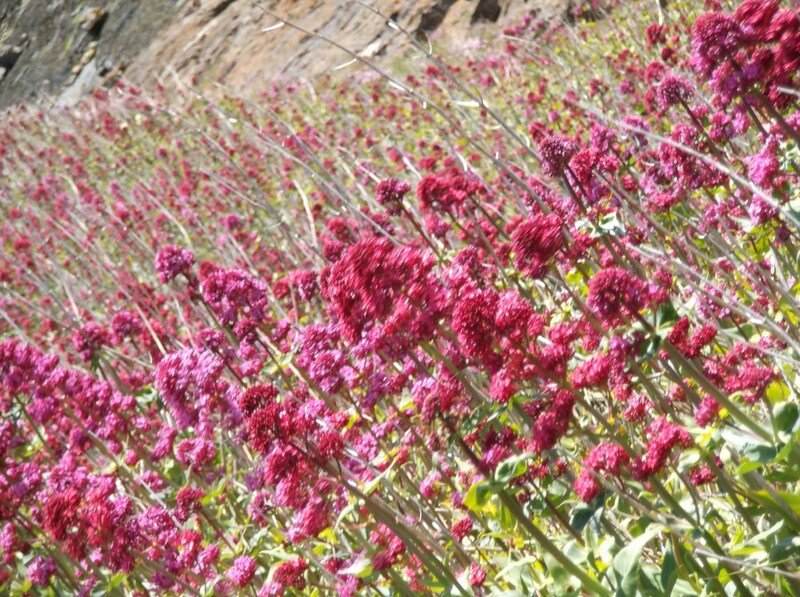 And look down, at the banks of valerian on the lower castle reaches. We are back now with our fellow tourists. The ruins of the Priory are in our sights. A sunny lunch in the local pub. 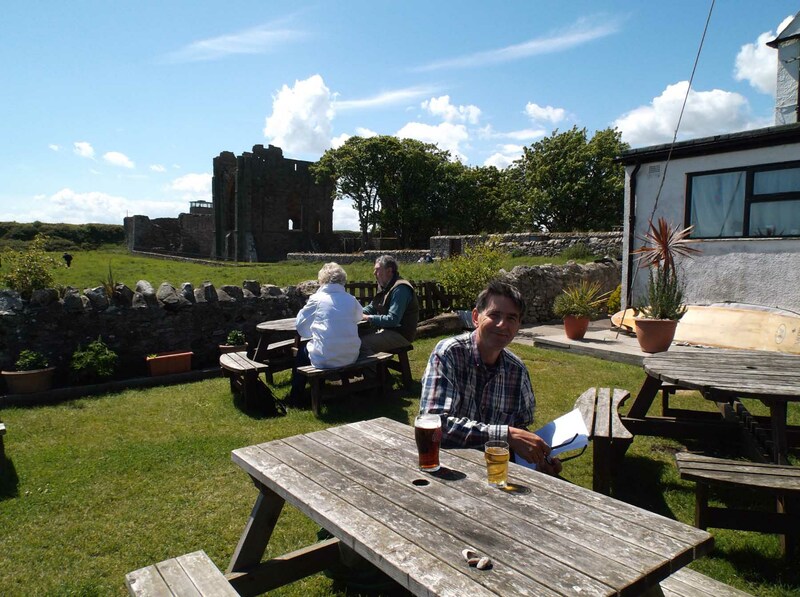 It’s quite an ordinary little pub, but how many other pubs sit so casually next to such magnificent ruins? 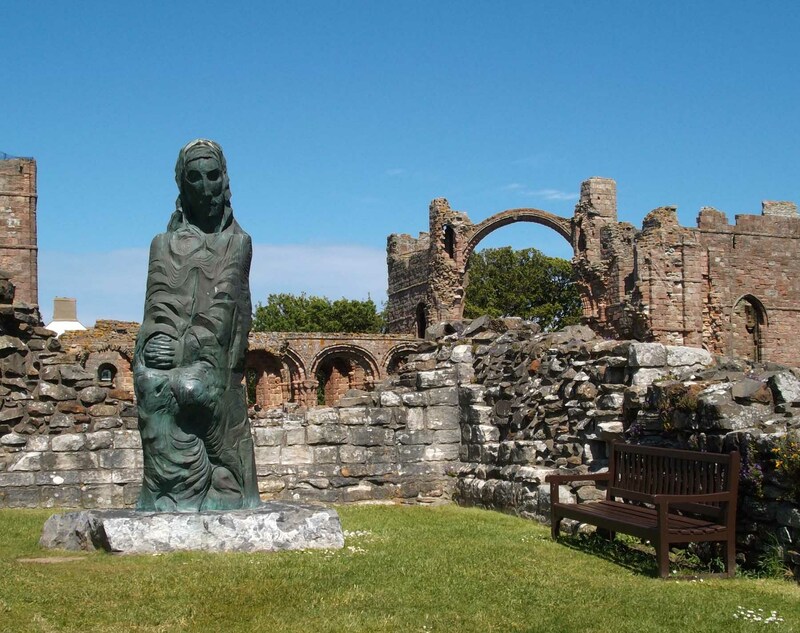 It was St Aidan who brought Christianity to these islands at the request of King Oswald of neighbouring Bamburgh Castle. The sainted Aidan was much loved and is still revered as a great saint, as is his successor, Cuthbert. But in many ways it has to be said that Cuthbert has overtaken Aidan in the popularity stakes. This is Cuthbert’s country. He was – and still is – hugely special to Northumbrians. They remember him locally as Cuddy. If you look carefully you’ll see the Cuddy duck (actually an Eider) nestling at the foot of this rather curious statue of Cuthbert. Crinoid fossils found on the beaches are Cuddy beads, and were once used to make rosaries. Today there’s a ginger cat asleep nearby, oblivious to everything but the sunny warmth. Aidan and Cuthbert never knew this stone built Priory. Aidan came here in 635, and Cuthbert is thought to have arrived here some 30 years later. They lived and worshipped in wooden buildings which have completely disappeared, but are thought to have been on the same site. 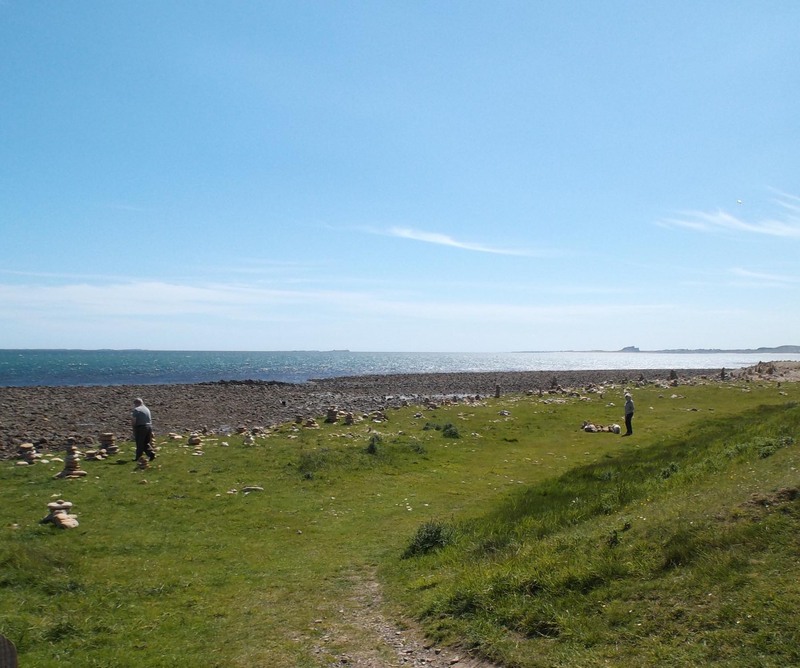 Given the simplicity of the monks’ lives here on Lindisfarne it is truly extraordinary that one of the finest books extant, the Lindisfarne gospels, was copied and illustrated here. 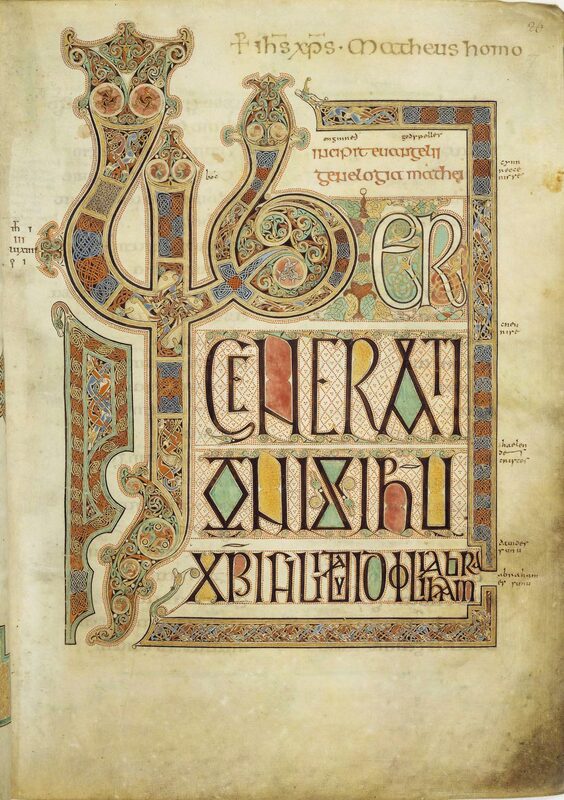 The Lindisfarne Gospels are thought to be the work of Bishop Eadfrith, Cuthbert’s successor on the island. They are now one of the greatest treasures of the British Library. First page of St Matthew’s gospel. Image made available to the public domain by Wikipedia. 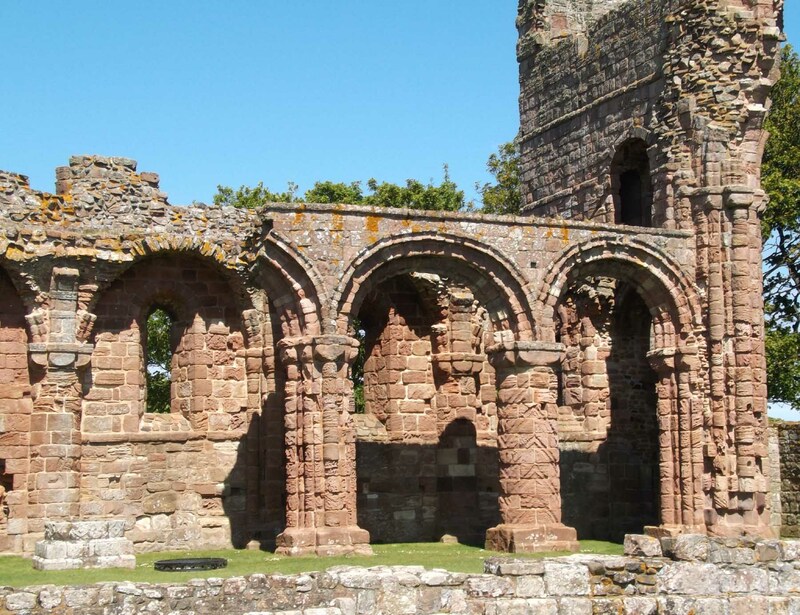 The monks left Lindisfarne in disarray when Viking raiders began a series of attacks on the monastery at the end of the 8th century. 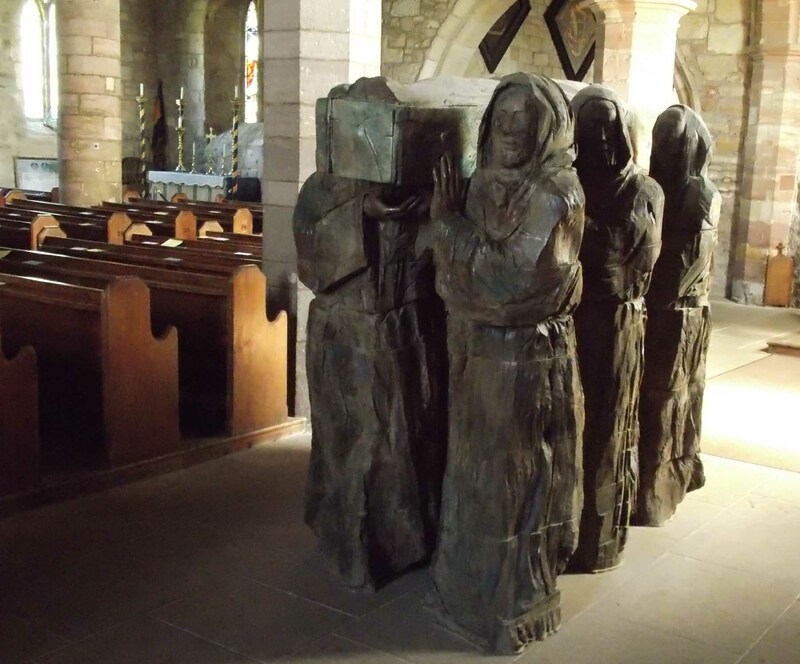 But they took the body of their beloved St Cuthbert with them, and a fine wooden carving in the church commemorates their devotion. In the 12th century monks returned to build the Priory that we see today. It is a beautiful building, and despite the exposure to the elements still looks amazing. You can still make out the details of the chevrons on the columns. Even in the Priory, it is the Castle perched on Beblowe Crag that dominates. 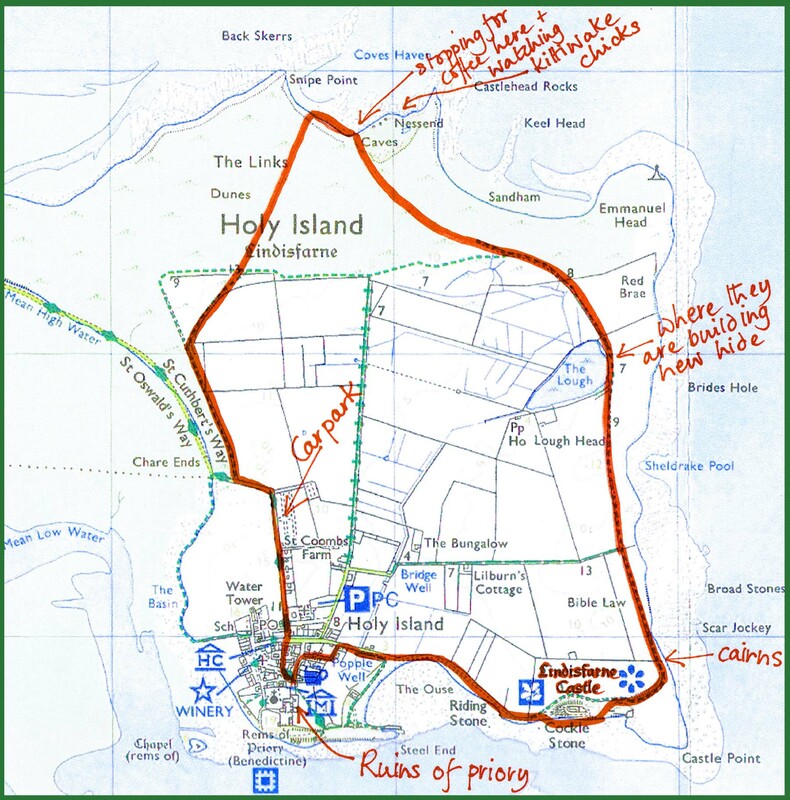 It intrigues me that when I speak of gazing longingly at Holy Island, it is a conflation of the image of the Castle and the ethos that the monks created that sits in my mind. The Castle is the stronger visual symbol of the place, but without the history of Aidan, Cuthbert, Eadfrith, and all their fellow unknown monks, it could just be another castle. Of course, Mother Nature has a strong part to play in making this place remarkable too! Time to face the world again. 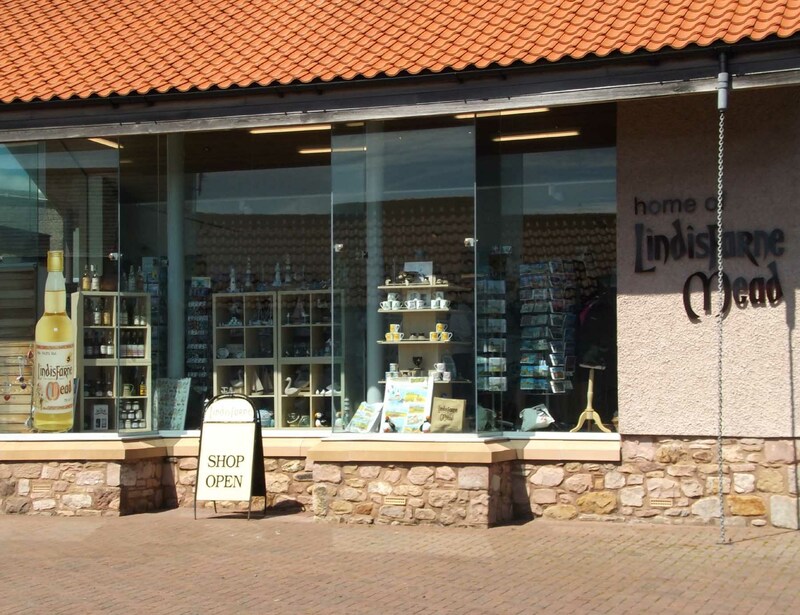 There’s the whole Lindisfarne/Holy Island retail experience. And then we join the pedestrians walking back to the car park. I hope they will return to the mainland as refreshed by their visit to Holy Island as I have been.